Measuring 60 in. 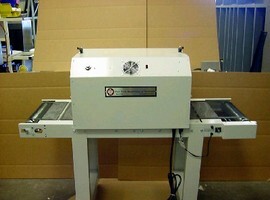 long, Model PP1860-W-1 conveys pad printed parts through drying chamber for post-treatment. Conveyor belt is 18 in. wide with 6 in. clearance inside chamber, which is 30 in. long. Temperature at face of heating element reaches 700Â°F, and at belt level, temperature is approximately 300Â°F. Unit comes equipped with adjustable heat shields at both ends of chamber, and conveyor belt speed dial to control amount of time printed item spends in chamber. EAST DORSET, Vt. - Responding to requests from customers for a flexible and durable parts dryer that can be integrated into in-line pad printing manufacturing environments, Pad Print Machinery of Vermont has created the Pad Print Conveyor Dryer. The Pad Print Conveyor Dryer (PP1860-W-1) is an Infrared dryer that conveys pad printed parts through a drying chamber for post-treatment. "Our customers needed something with a little more power and flexibility than was currently on the market," said Julian Joffe, president of Pad Print Machinery of Vermont. "We created this dryer specifically with our high-speed, in-line printing customers in mind as the finishing touch on a seamless secondary manufacturing process that includes pad printing for parts marking and product decorating." The new PPMoV dryer's conveyor belt is 18 inches wide with a 6-inch clearance inside the chamber. The drying chamber is 30 inches long, and the overall conveyor length is 60 inches. The temperature at the face of the heating element reaches 700 degrees Fahrenheit, and at belt level the temperature is approximately 300 degrees F. The element is adjustable in height and can be lowered to increase the surface temperature of the printed part to more than 300 degrees. The unit comes equipped with adjustable heat shields at both ends of the drying chamber and a speed control dial for the conveyor belt to control the amount of time the printed item spends in the chamber. For more information about the Pad Print Conveyor Dryer and Pad Print Machinery of Vermont's full line of pad printing machines and consumables, go online to www.padprintmachinery.com, or call 800-272-7764.